Since 2008, hundreds of students and members of the local community have benefited from the dental school's pioneering community engagement model. In 2006, Professor Liz Kay came to the University of Plymouth as the inaugural Dean of the Peninsula Dental School - the first dental school to be established in the UK for 40 years. Building on her research, she introduced a new model of dental education, focused on primary care, clinician-led teaching, and a desire to benefit the local community. She wanted to give students hands-on experience helping the people overcome oral health inequality, so in 2008 she set up a community engagement team - which has grown from two staff to a team helping dozens of local organisations. Read more about Professor Liz Kay's academic journey in University magazine Invenite, and see some of the projects and achievements from the last 10 years below. "Community engagement is really the jewel in the crown of Peninsula Dental School. Not only have we produced superb dentists who are empathetic to their patients, and while doing that addressed oral health inequalities, but our methods have also been adopted by other dental schools in the UK and further afield. Wendy Smith and Nicola Brown (pictured here with Director of Social Engagement and Community Based Dentistry, Rob Witton) were the first two people in the Community Engagement team at Peninsula Dental School. "Our first role was to recruit patients for the Devonport Dental Education Facility, where University students would treat real-life patients under the supervision of clinicians. 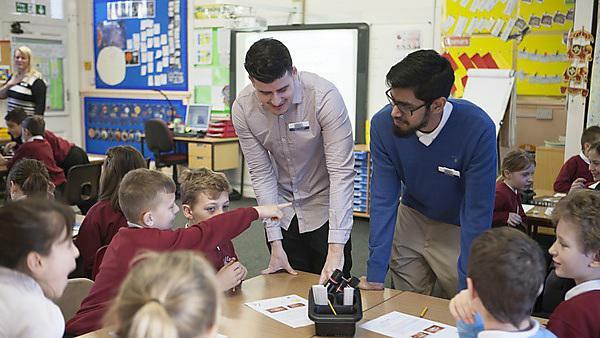 We have since gone on to create new and exciting community based projects which raise the profile of oral health, as well as giving students the chance to go into the community and help people overcome oral health inequality." PDSE is a Community Interest Company (CIC) committed to improving oral health across the South West. They: run Dental Education Facilities in Plymouth, Truro and Exeter, where students from the University treat NHS patients; improve awareness of oral health in the wider community, focusing on groups such as schoolchildren, the elderly, parents, those with specific conditions, people with special needs substance abusers, the homeless, prisoners and; ensure access to dental care for all, but especially to those groups who may feel excluded from mainstream dentistry. It's the community engagement partner of the Faculty of Medicine and Dentistry, and helps disadvantaged groups to access services and adopt positive lifestyles. Dental Therapy and Hygiene student Georgia Snape and her peers worked with Nomony Children's Centre as part of their year 2 Inter Professional Engagement module. Encouraging children to brush for two minutes, Georgia wrote up a dental version of 'The Wheels on the Bus', which has been published as part of an article for the British Dental Journal.